54 Commonwealth is located on the south side of Commonwealth, between Berkeley and Clarendon, with 50 Commonwealth (260 Berkeley) to the east and 56 Commonwealth to the west. 54 Commonwealth was designed by Ahearn-Schopfer and Associates, architects, and built in 1986 as a seven-story, seven-unit apartment building. It was built for the 54 Commonwealth Development Corporation, which is shown as the owner on the original building permit application, dated March 20, 1986. 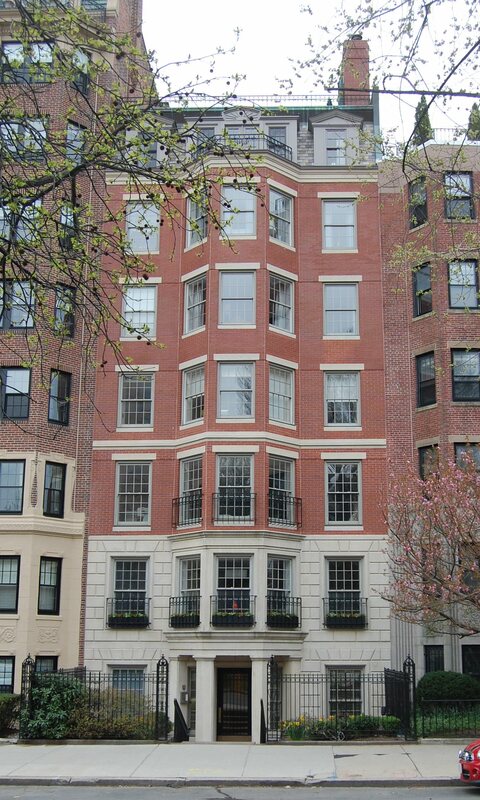 The building was originally proposed to be nine stories, but was reduced to seven stories to comply with the Back Bay’s 65-foot height limit. 54 Commonwealth was built on a lot which had been vacant since 1936, when the original townhouse was purchased and razed by James Allen Mason. In December of 1939, he transferred the lot to William B. Cohen and Lawrence Mason, trustees of Commonwealth-Berkeley Associates. James and Lawrence Mason were brothers (the sons of William and Mae (Rudnick) Mason), and William B. Cohen was their uncle (William Cohen’s wife, Anna (Rudnick) Cohen was the sister of Mae (Rudnick) Mason). Commonwealth-Berkeley Associates also owned the apartment house next door, at 50 Commonwealth, which they had built in 1925-1926. Click here for an index to the deeds for 54 Commonwealth. 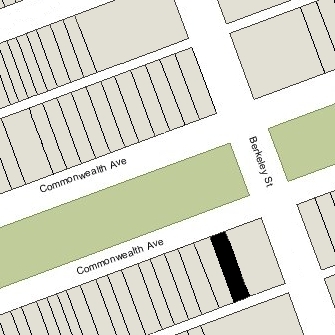 On July 27, 1966, 50 Commonwealth and the lot at 54 Commonwealth were acquired from William B. Cohen, his wife Anna (Rudnick) Cohen, and their daughter, Rosalie (Cohen) Geller, trustees of the Commonwealth-Berkeley Associates, by real estate dealer Nathan R. Miller. On March 26, 1971, both properties were purchased from Nathan R. Miller by John T. Manelas, Jr., trustee of the Grosvenor Realty Trust, and on September 18, 1985, both properties were purchased from John Manelas by John R. Giles, trustee of the 50 Capitol Realty Trust. On February 7, 1986, the lot at 54 Commonwealth was purchased from John R. Giles by the 54 Commonwealth Development Corporation (Robert M. Barsamian, president), which constructed the new apartment house on the lot. In February of 1988, after the building was completed, 54 Commonwealth Development Corporation converted the building into seven condominium units, the Berkeley Place Condominium. The original house at 54 Commonwealth was designed by Snell and Gregerson, architects, and built ca. 1866. It had been one of four contiguous homes (54-56-58-60 Commonwealth) built at the same time in a Georgian Revival style, with bow fronts and balustraded parapets above the main cornice. 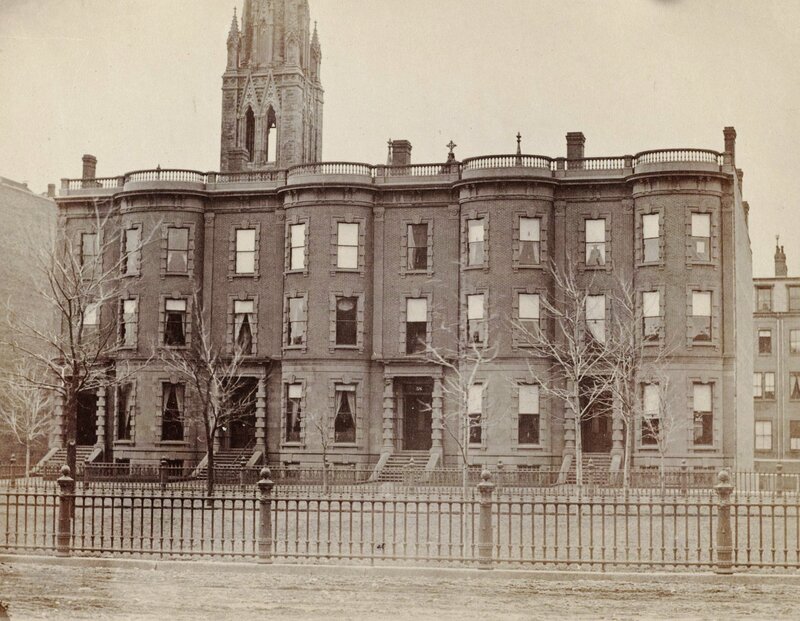 54 Commonwealth was built as the home of Dr. John Cauldwell Sharp, a physician, and his wife, Helen (Sayles) Sharp, on land he purchased from the Commonwealth of Massachusetts on January 4, 1866. At the same time, Helen Sharp’s mother, Mrs. Maria (Francoeur) Sayles (the widow of Willard Sayles), had 56 Commonwealth built, and Helen Sharp’s brother, Henry Sayles, had 58 Commonwealth built. John and Helen Sharp previously had lived at 40 Commonwealth. On June 13, 1878, John Sharp transferred 54 Commonwealth into his wife’s name. John Sharp died in September of 1890. Helen Sharp continued to live at 54 Commonwealth with their unmarried daughters, Helen Sharp and Marie Francoeur Sharp. Marie Sharp married in February of 1903 to Frank Brewster, an attorney, and they lived with her mother and sister after their marriage. In July of 1906, John and Helen Sharp’s son and daughter-in-law, Arthur Russell Sharp and Mary (Sparks) Sharp, purchased and moved to 52 Commonwealth. Helen (Sayles) Sharp died in April of 1919. The Brewsters and Miss Helen Sharp continued to live at 54 Commonwealth. They also maintained a home in Devereux, Massachusetts, through about 1930, and in Marblehead thereafter. Marie Brewster died in 1932, Helen Sharp died in September of 1934, and Frank Brewster died in November of 1935. On April 15, 1936, 54 Commonwealth was acquired from Marie Brewster’s estate by James Allen Mason. Two days later, he applied for (and subsequently received) permission to demolish the house. It remained a vacant lot until the mid-1980s.